Began to notice this week that we are moving into Spring. A few bulbs are beginning to poke their green stems skyward, and the magnolia tree in the front garden is starting to show opening buds but it will be a month or more before the flowers appear. Leaving work at the end of the day and it isn't fully dark any more; there was a twilight blue tinge to the sky last night. The sun is clearing the houses opposite and now adds milky yellow light to the bedroom before I finally rise in the morning. At the station the ubiquitous robins still chattered in the trees and shrubs, but now ring doves and wood pigeons cooed in the higher branches adding their voices. Querulous parakeets and magpies argued over perching rights, and a pair of pied wagtails skipped, flitted, wagged and chittered along the platform. Nature is waking up; it willl soon be Summer. With a two car shuffle between the end point and the start out of the way we grabbed a coffee, and headed off down the A road towards the NDW where it crosses the River Mole. With previous days weather Burford Meadow was under water, and the stepping stones, the fun way of crossing the river, were hidden under the brown swirling murk of the Mole. Crossing the bridge was not much easier with run off from the meadow forming mini lakes that required deft footing to avoid an early soaking. From the meadow the path climbs steeply up to Box Hill with views across to the vineyard behind us opening up as we climbed. It soon became clear that unlike the earlier sections of the Way the route doesn't stick to the ridge but continually drops and climbs, circumnavigating settlements, lime works and quarries. All this ascent and descent was good training for the TGO challenge. Past Juniper Hill the path switches back for a sharp pull back up to ridge from where we enjoyed expansive views to Leith Hill, the South Downs and the High Weald in the late afternoon sun. We had a brief stop at the Inglis Folly and another at Reigate Fort for a few snaps, and before long we had arrived at the car park and the end of our walk. The tea hut was raided for a welcome brew before the return to Box Hill to collect the other car. Completion of this leg meant that the the four of us; Darren, Penny, and I, with Harry the dog have now reached the half point of the NDW. With Darren off to Co Durham at the end of February we aren't going to finish what we've started but we do have plans to one more bit. I've enjoyed our day trips out and I'm hoping that we'll be able to get some weekend backpacking trips in together over the coming months. There are maps to find, gear to be selected, decisions to be made over how much and what food to carry, and what stove to take. Here's a video shot by Darren of me talking through the features of the backpack. Likes: weight, capacity, features, fit. From email exchanges with Kelly, Customer Services Manager, at Osprey UK the Exos series rucksacks are in the process of being shipped to the following suppliers; Ellis Brigham, Costwolds, Snow and Rock, Outside and, Countryside Ski and Climb. All will stock the Exos 46 but only Snow and Rock will carry the smaller Exos 34, and Countryside the larger Exos 58. Details of the new model are now available on osprey's website here. I might fire them a quick email to find out whether they have sorted out suppliers in the UK yet. This humble piece of kit saw the cold, clear, winter light of day over the festive season. A battered blue Aladdin with the handle roughly hewn off (to save weight and ease packing) found it's way in to my rucksack. Ordinarily I'd use my Snow Peak 600 mug but when the weather has been as freezing as it has been, this mug comes into it's own. If you use herbal tea like me you get your money's worth as the tea bags stew for all their worth and the clip on lid, although not insulated, is essential for keeping drinks warm. On over night trips the mug will keep it's contents from freezing and you can use it to reconstitute dried food if you happen to be using the stuff. It's not that lightweight at 120g but having made a cosy for my Snow Peak to save weight it's no where as thermally efficient, so it's the battered blue mug every time. The day dawned bright and sunny but the high pressure that had given us the cold spell was moving off to the continent and blustery, warmer weather was moving in from the west. The ground that had remained frozen this last week had began to thaw and as the temperature rose the ground got softer. May be not the best time to be heading out on a circuit through woodland and fields that sit on top of the clay vales at the foot of the Chiltern escarpment then. The Ridgeway long distance path runs along the base of the Chilterns at this point and I remembered how difficult the going was when I walked it a few years back, especially after it had been churned up by four by fours. Thankfully we were on footpaths and the ground was, by comparison, relatively easy going. I did begin to appreciate where the phrase 'feet of clay' seemed to come from by the end of the day. The blustery wind helped the aerial displays of red kites that were successfully re-introduced to the area in the 1990's. Gracefully gliding on gusts of wind they were relatively easy to capture on a compact digital camera but in doing so I burnt out a set of rechargeable batteries in the process. The guidebook hinted that we might see greater spotted and green woodpeckers in the woodland but on this occasion it was not to be. However we were content with watching the aerial antics of the red kites above the fields as we crossed them. I found this when browsing at lunch time. It's a brilliant idea and certainly isolates one of the objections that some have about using a tarp. Now my needlework skills are non existent so not much use to me. But if Darren finds a suitable stitcher for one of his projects, I'm keeping this under cover as I don't want to let the cat out of the bag, then I think I might commission said stitcher to run one up for use with my Hut 2 and BPL tarp. Lots of stuff to look forward to. One new years resolution, nay promise, is to get out under silnylon at least once a month. And to get out on day trips as often as time at weekend allows, with a focus on a different set of hills on the outskirts of London. Having spent the last six months of last year trotting over and along the north and south downs I'm looking west to the Chilterns. That's not to state that the on going section hiking of the North Downs Way has been dropped -- Darren and I are set to do the next leg towards the end of the month. There's a summer trip to the Picos that's in discussion, along with a bike packing bivi trip that being peddled around. 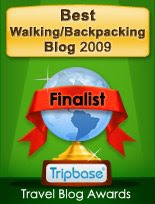 With all these trips and excursions perhaps it's time to revisit mobile blogging again. Finally I've got some new bits and pieces for Christmas that I've got reviews to post.